CommuniGator Help SiteGatorMailCampaigns What is Gator Mail?What Gator Mail can do for you! Gator Mail is the core of CommuniGator. As a marketing automation service Gator Mail is our bread and butter. With GatorMail you can create sophisticated email campaigns to send out to set audiences and groups. These can be automated within your instance to send out at set times and dates and close at set times and dates. This will provide you with a system that helps your business grow and expand with less manual work on your part. Creating a campaign to attach to your emails to is crucial. You want to be able to control when they send, who it sends to, and the time period it runs for. We recommend using our traditional campaign creation instead of quick campaign for a more in depth design process. However, the 'Quick Campaign' creation is useful for a basic design and quick distribution. Do be aware that with quick campaigns the editing options after the campaign has been sent are very limited. With traditional campaign creation you can modify extensively after sending. 1. Here you must enter the name of your campaign. You will also see the 'Status' box. This shows if your campaign is live or not. Currently as we are creating it it shows as 'In Setup'. 2. Here you need to set the start and end date. Be very careful when selecting these because many errors occur by inputting the details wrong. The end date must be in the future to the start date, and check the time to make sure it sends at peak time for your business (or not depending on your preference). 3. This determines your campaign type. You can choose from Email, SMS, Follow Up/Workflow Campaign, and RSS Email. You can also determine the action type. This sets what your campaign will act as. For more information on what action types mean, please click here. 4. The Sender Email and Reply Email are crucial elements of your campaign. If you do not put the reply email as one which can receive emails then you cannot view any replies sent to it. It might be useful having two separate emails, one as a sending email and one as a receiving email. Within the audience tab there are a few sections. 1. This is where you select the audience type. Generally this is a group which you have created before setting up your campaign, but you can create and attach a group later one. Or you can select 'Audience Selection Criteria'. Within this you can apply an audience based on a CSV import, add using contact data, or have selection criteria that need to be met in order to attach a contact. 2. Here you pick the group you wish to attach. 3. You must count the audience to see group data. This tab is for adding an email you have created which you wish to be sent out in your campaign. 1. Here you will choose what type of email you are attaching. 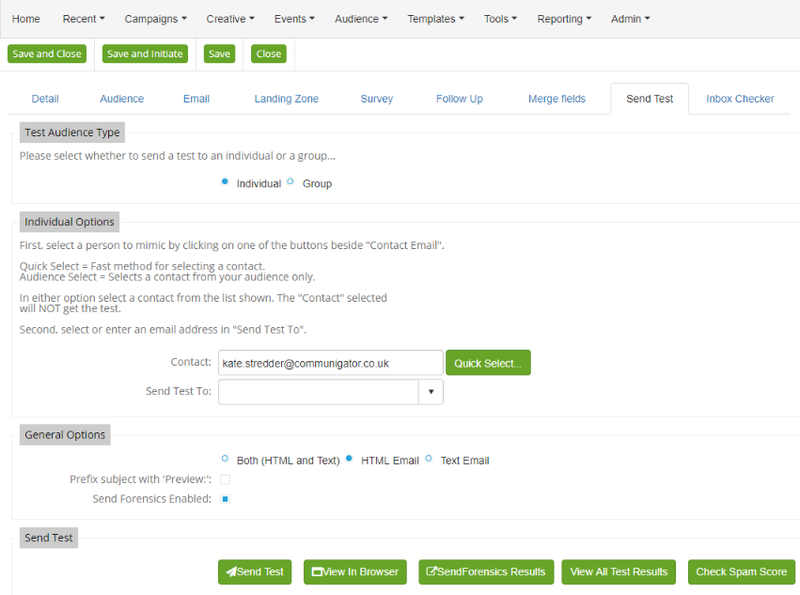 A split test campaign is used when you want to attach two different emails to a campaign to send separately. 2. Now you can attach your email. This can be one you have created, or you can create a new one from the button shown. Any dynamic content, articles etc will appear in the relevant sections, so you can ensure they are pulled across. In this tab you can attach a landing zone. This means you can monitor who clicks on certain parts of your email campaign. You have the option to add an existing landing zone or create a new one. Here you can add a survey to your campaign. You have the option to choose from attaching an existing survey or creating a new one. The follow up tab allows you to select a campaign to send follow up campaigns from. This is useful for when someone fills in a web capture from an initial email campaign and filling it in requires a second campaign to be sent to them. This is known as a follow up. The names and descriptions of your follow ups will be shown in a list below the attach field. 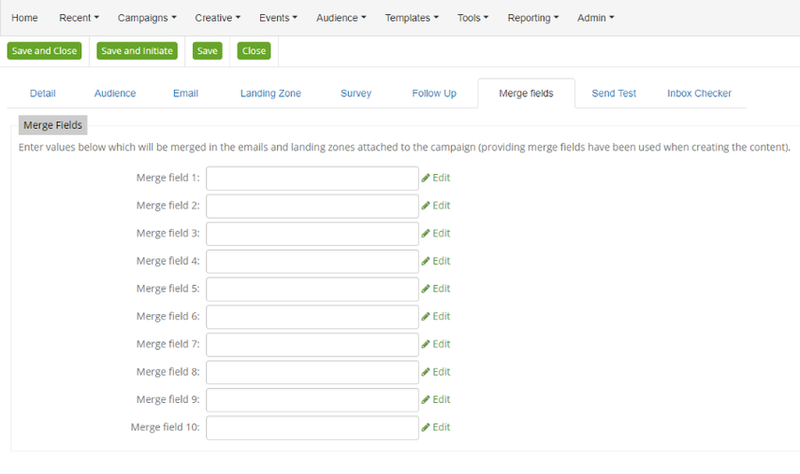 When creating an email you have the option to add in merge fields. These will be fields such as 'Come to our conference on the [dd/mm/yy] to celebrate!'. A merge field will pull in data you have set in one of the fields shown above. Once you have determined what you want a merge field for, write the information in a field above. Within your email you must then select the merge field you put the information in i.e. Merge Field 1. The 'Send Test' tab is crucial for ensuring your campaign works properly before the customers receive it. 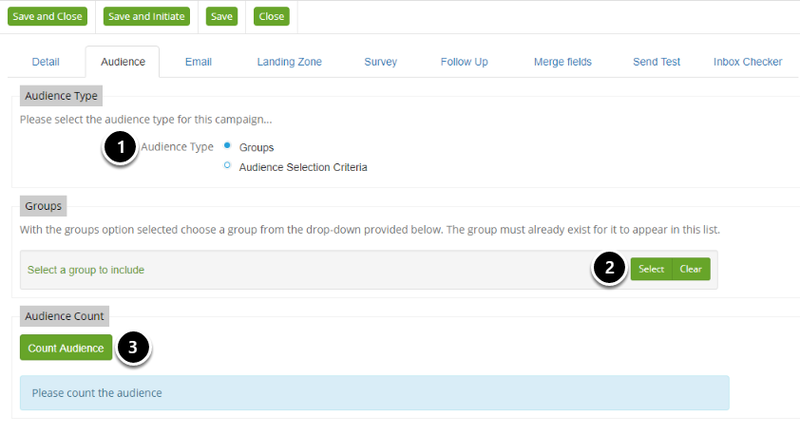 If you are creating the campaign individually and want the test sent to you only then select 'Individual' for 'Audience Type'. If you wish to send it to multiple testers then select group. You will have to create a group for this. Make sure you add an email to send the test to, then you can initiate the test. If you have SendForensics then you can analyse the email to make sure it wont go into spam. Under 'General Options' you can choose the format the email is sent in. Sending both HTML and Text is a good idea to test the email on multiple formats, however it is not explicit that you do this. We highly recommend that you use this tool for every campaign. These campaign creation functions are the backbone of GatorMail and help guide you through your campaign creation. Sending out emails, whether they are advertising to clients, informing customers of new products, inviting customers to an event or just for internal use, are essential for any successful business. We recommend traditional campaign creation for a more in depth, controlled design experience. Quick campaign is recommended for those who want to send out a campaign quickly with little design intervention. Please click here for in depth information and guides on email creation. Landing Zones are excellent tools to use within an email or email campaign. They can be made separately from the campaign screen and attached, or you can create them within an email. Landing Zones can be used for a range for things such as a ‘more information’ page, a personalised profile page, or a web capture form should you have the functionality available to you in your package. Landing Zone’s can also be linked together within a campaign in order to create a micro site. Landing Zones can also be used to hold information that is campaign specific for a particular piece of information that, by a contact landing on the page shows that they were interested in the topic. It is essentially a multifaceted tool that tracks clicks, links, forms and more.